In an apocalyptic world in which everyone over the age of 18 has turned into a bloodthirsty, flesh-hungry zombie and most youngsters have been served as meat to quell their elders' appetite, a small team of kids and teenagers tries to survive on their own. As part of that small group of survivors, you must unite to escape the relentless horde of undead. Run across town to find shelter or food, hold a strategic position, meet with new survivors, and discover the truth about this terrible and mysterious disease! 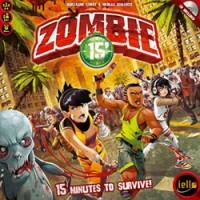 Zombie 15' is a frantic, scenario-based survival game in which time is scarce and cooperation is key. The game features easy rules but real choices to be made as quickly as possible if you don't want to get overwhelmed by zombies! Ah yes. Zombies. Now there is a new theme for a game. Something never done before. Yawn right? Well…this one is a little different. Let me start by saying this feels more like an arcade video game than it does a co-operative survival style board game. It is a pain. Takes about 15 minutes…so it should be called Zombie 30. 15 minutes to set up, 15 minutes to play? Anyway you can play this with 2-4 people. If you play with 2 plays I recommend each player plays with 2 of the characters. There are pros-cons to each character but I’m not going to get into that, I’ll just say there is enough for replay (like multiple characters in a video game). In Zombie 15 only people under 18 are alive, everyone else is a Zombie. You need to survive. You and your friends are trying your best to not die and you have an objective, normally you need to get somewhere before time runs out. You pick the scenario you want and set the game up using tiles, items and a lot of zombies. After it is set up it looks similar to how the game Zombies!!! ends, but I assure you it is different. Next you start the CD that goes for 15 minutes and the fun begins! 2) At the actions you may have to fend off Zombies if there are some in your area and you were unable or didn’t get the chance to kill them. This is dependent on your weapon. Each weapon has a number for how many zombies it can kill each use, how many it can fend off at the end of your turn, and how much noise it makes. That’s it! Easy right? Just get from point A to point B. If you survive you can carry items over to the next scenario, and that is what makes this game different. It is really fun. Easy to learn and reply seems to be there (I have not yet completed all 10 scenarios that it came with). So that is my quick review of Zombie 15. Oh I forgot something. If you make noise you add a zombie to the hoard box. No big deal. I hope this review was helpful… Oh one more thing. Every 45 seconds if you play on hard or 60 seconds on easy a zombie growls. After a growl you draw a Hoard Card and it could have a number on it. If there is a number place that many zombies in the street area of the player whose turn it is. If there isn’t a number and it says hoard, you dump the hoard box out onto the street oh whomever turn it is. So you might go from 0 zombies in an area to a dozen in just a minute. Add a Review for "Zombie 15′"